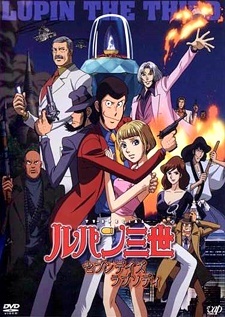 Lupin and Jigen planed to steal enormous money from a racetrack in New York. Their plan is perfect and the only thing remains is to wait for 6 days. To celebrate the success beforehand, they go to a town. Lupin parts from Jigen because he recalls another engagement. Then, Lupin saves a girl, Michelle, being chased by suspicious men. She asks Lupin to steal a diamond from her father in order to stop him from doing evil things. Lupin thinks he can get both money and a diamond 6 days later, and he accepts her request to guard her for 6 days.